We rise early but we’re not over easy! The Early Risers serve the best Audio Breakfast around; now we're up late, cooking up food for you and your date. We may be tough shells to crack, but don't be late, because we won't hesitate, to deliver our best to you on each and every dinner plate. Bon Appetit! 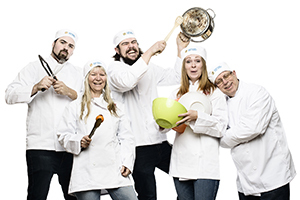 Learn more about KitchenAid® Cook for the Cure Moncton.